Arup Ghosh’s image of a barber at work in West Bengal won the top honours in the amateur category at the Sony World Photography Awards 2008. Frame after frame at the Sony World Photography Awards 2008 Global Tour pays homage to that greatest muse of all, life. Humdrum, stodgy, pretty, charming, awkward, ecstatic—life that refuses to be snuffed out by strife, even microscopic life. Caught in its everyday ebb and flow, the keen gaze of the camera morphs its ordinariness into award-winning pieces of photography. Take, for instance, Arup Ghosh’s black and white shot of a barber at work in Bardhaman, West Bengal. The scene is commonplace but the barber’s face, a study in concentration as he shaves his emaciated customer’s cheeks, elevates the action almost to the level of an art. Ghosh’s entry is reminiscent of stills from Satyajit Ray and Ritwik Ghatak films in its simplicity. The picture, taken one Sunday when Ghosh took his daughter to the barber’s to paint, was judged the best in the amateur category by the 100-member jury. In direct contrast to Ghosh’s barber is Dutch photographer Robin Utrecht’s series on the amputee soccer team from Sierra Leone. If Ghosh’s shot is a picture of calm and quiet efficiency, Utrecht’s subjects, all war victims who lost one or more limbs during the civil war of 2002, are the embodiment of grace in motion. Shot in an abstract style, the photographs won Utrecht the highest award in the sports category. You can almost hear the cheer going up from the stands as a player, the lower half of his body missing, dodges past an opponent on crutches. In another, an amputee player raises his maimed body over his crutches to celebrate a win, his smile lighting up the frame. The other Indian to be honoured this year is Anil Risal Singh, 54, whose shot of a computer chip fetched him the second runner-up award in the science category. Singh, a professional photographer, is employed by the Union Ministry of Culture’s National Research Laboratory for Conservation of Cultural Property in Lucknow. British photographer Vanessa Winship was named Photographer of the Year for her portrait series Sweet Nothings. 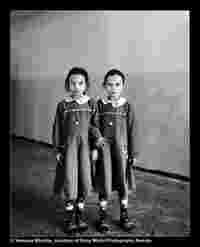 Photographer of the Year Vanessa Winship’s series, Sweet Nothings is, however, the most striking. Shot in Turkey, the series features schoolgirls in blue tunics and white, lace-collared blouses embroidered with sweet messages. The backdrop, of land that borders Syria, Iraq, and Iran, is harsh, revealing a life that is tough and uncompromising. Winship says that these hand-embriodered messages on the girl’s uniforms are “uniformly sweet". The dresses, all identical, hint at a regimented upbringing. But what’s not uniform is the girls’ eyes—surprised, curious, hesitant, shy, and, as the very last frame in the series portrays, spilling with barely suppressed mirth. That’s the emotion that lingers in your heart as you walk away from the show—being alive is reason enough to smile. Living is indeed an art. Sony World Photography Awards 2008 Global Tour is on at The Stainless Gallery, MIRA Corporate Suites, Okhla Crossing, New Delhi, until 19 November.